A 61-year-old P&O employee has been arrested over the deaths of three sailors and the disappearance of their yacht in the English Channel. Ouzo had left Bembridge, Isle of Wight, for Dartmouth, Devon, on 20 August. The bodies of Jason Downer, 35, from Kent, Rupert Saunders, 36, and James Meaby, 36, both from London, were found in the sea two days later. 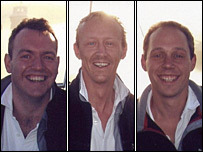 The man, from Dover in Kent, worked on the P&O-owned Pride of Bilbao ferry and was arrested on Wednesday. He was questioned on suspicion of causing manslaughter through gross negligence before being released on bail pending further inquiries. P&O has confirmed that one of its employees was arrested in connection with the deaths of the three sailors. Chris Laming from P&O said the man arrested did work on the Pride of Bilbao, which is based out of Portsmouth. Det Insp Nigel Niven said: "Whilst we continue to maintain an open mind as to the cause of this incident, the inquiry is currently focussed on the potential involvement of the Pride of Bilbao." 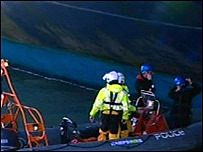 During an investigation police and the Marine Accident Investigation Branch examined the hull of the ferry, along with the vessel's "black box" data recorder. Coastguards said no Mayday distress call was received from the Ouzo, and the only remnant of the yacht that was found was a fender. Coastguards believe the 27ft (8.2m) Sailfish sloop may have been in collision with a larger vessel. Post-mortem examinations showed that Mr Downer and Mr Saunders died from drowning, while Mr Meaby died from a combination of hypothermia and drowning.